Scraping data from a website is one the most underestimated technical and business moves I can think of. Scraping data online is something every business owner can do to create a copy of a competitor’s database and analyze the data to achieve maximum profit. It can also be used to analyze a specific market and find potential costumers. The best thing is that it is all free of charge. It only needs some technical skills which many people have these days. In this post I am going to do a step by step tutorial on how to scrape data from a website an saving it to a database. I will be using BeatifulSoup, a python library designed to facilitate screen scraping. I will also use MySQL as my database software. You can probably use the same code with some minor changes in order to use your desired database software. Please note that scraping data from the internet can be a violation of the terms of service for some websites. Please do appropriate research before scraping data from the web and/or publishing the gathered data. I have also created a GitHub project for this blog post. I hope you will be able to use tutorial and code to customize it according to your need. The following installation instructions are very basic. It is possible that the installation process for beautiful soup, Python etc. 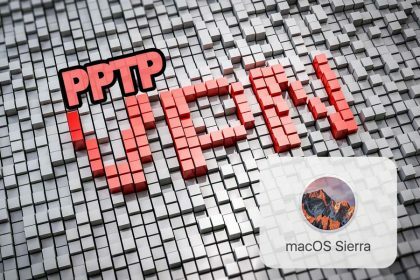 is a bit more complicated but since the installation is different on all different platforms and individual machines, it does not fit into the main object of this post, Scraping Data from a Website and saving it to a Database. In order to install Beautiful Soup, you need to open terminal and execute one of the following commands according to your desired version of python. Please note that the following commands should probably be executed with “sudo” written before the actual line in order to give it administrative access. If the above did not work, you can also use the following command. If you were not able to install beautiful soup, just Google the term “How to install Beautiful Soup” and you will find plenty of tutorials. In order to able to connect to your MySQL databases through Python, you will have to install MySQLdb library for your Python installation. Since Python 3 does not support MySQLdb at the time of this writing, you will need to use a different library. It is called mysqlclient which is basically a fork of MySQLdb with an added support for Python 3 and some other improvements. So using the library is basically identical to native MySQLdb for Python 2.
requests is a Python library which is used to load html data from a url. In order to install requests on your machine, follow the following instructions. Now that we have everything installed and running, let’s get started. I have created a page with some sample data which we will be scraping data from. Feel free to use this url and test your code. The page we will be scraping in the course of this article is https://howpcrules.com/sample-page-for-web-scraping/. 1. First of all we have to create a file called “scraping_single_web_page.py”. 3. Let us create some variables where we will be saving our database connection data. To do so, add the below lines in your “” file. 4. We also need a variable where we will save the url to be scraped, into. After that, we will use the imported library “requests” to load the web page’s html plain text into the variable “plain_html_text”. In the next line, we will use BeautifulSoup to create a multidimensional array, “soup” which will be a big help to us in reading out the web page’s content efficiently. These few lines of code were enough to load the data from the web and parse it. Now we will start the task of finding the specific elements we are searching for. To do so we have to take a look at the page’s html and find the elements we are looking to save. All major web browsers offer the option to see the html plain text. If you were not able to see the html plain text on your browser, you can also add the following code the end of your “scraping_single_web_page.py” file to see the loaded html data in your terminal window. 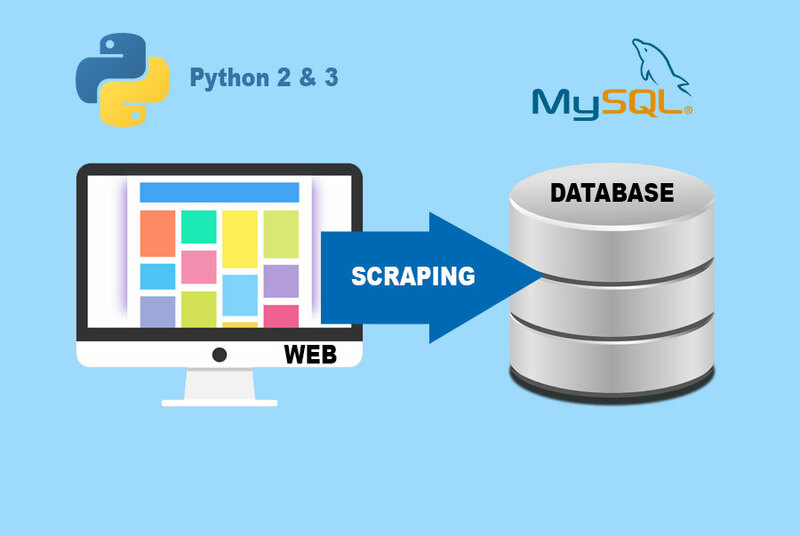 To execute the code open terminal, navigate to the folder where you have your “scraping_single_web_page.py” file and execute your code with “python scraping_single_web_page.py” for Python 2 or “python3 scraping_single_web_page.py” respectively. Now, you will see the html data printing out in your terminal window. According to the above, all text inside the <td> tags are relevant and need to be stored in appropriate variables. To do so we first have to parse all <td>s inside our table. #Get the tables where the dates are written. 9. We now have to go through all the tables and save the data accordingly. This means we have to create a for loop to iterate through the tables. In the tables, there is always one row (<tr> tag) as the header with <th> cells inside (No <td>s). After the header there can one to several rows with data that do interest us. So inside our for loop for the tables, we also have to iterate through the individual rows (<tr>s) where there is at least one cell (<td>) inside in order to exclude the header row. Then we only have to save the contents inside each cell into appropriate variables. #Split this cell into two different parts seperated by 'to' in order to have a start_date and an end_date. #Split this cell into two different parts seperated by 'to' in order to have a start_time and an end_time. Please note that the above code reads the data and overrides them in the same variables over and over again so we have to create a database connection and save the data in each iteration. Now, we are all set to create our tables and save the scraped data. To do so please follow the steps below. 10. 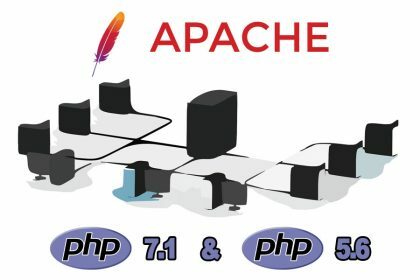 Open your MySQL software (PhpMyAdmin, Sequel Pro etc.) on your machine and create a database with the name “scraping_sample”. You also have to create a user with name “scraping_sample_user”. Do not forget to at least give write privileges to the database “scraping_sample” for the user “scraping_user”. 11. After you have created the database navigate to the “scraping_sample” database and execute the following command in your MySQL command line. 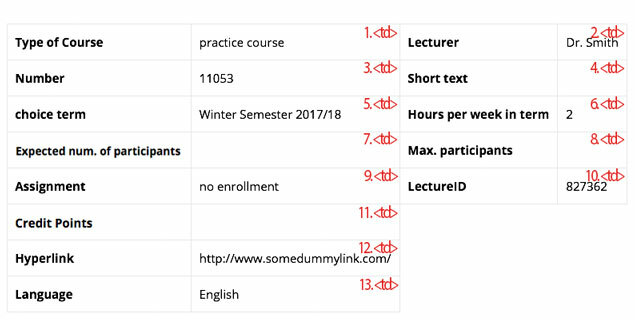 Now you have two tables with the classes in the first one and the corresponding events in the second one. We have also created a foreign key from the events table to the classes table. We also added a constraint to delete the events associated with a class if the class is removed (on delete cascade). We can go back to our code “scraping_single_web_page.py” and start with the process of saving data to the database. Here, we use the MySQLdb library to establish a connection to the MySQL server and insert the data into the table “classes”. After that, we execute a query to get back the id of the just inserted class the value is saved in the “class_id” variable. We will use this id to add its corresponding events into the events table. 13. We will now save each and every event into the database. To do so, navigate to the end of step 9, the line “max_participants = cells.text.strip()” and add the following below it. Please note that the following have to be exactly below that line and inside the last if statement. here, we are using the variable “class_id” first mentioned in step 12 to add the events to the just added class. This is the easiest part of all. The code will work just fine if you have different but similar web pages you would like to scrape data from. Just put the whole code excluding the steps 1-3 in a for loop where the “url_to_scrape” variable is dynamically generated. I have created a sample script where the same page is scraped a few times over to elaborate this process. To check out the script and the fully working example of the above, navigate to my “Python-Scraping-to-Database-Sample” GitHub page. Copyrights © 2017 HowPCRules. All Rights Reserved.